DVD Drive Repair is a software designed by Rizone Technologies. It offers the ability to restore the icon of a DVD drive when it is missing from the Windows operating system. Unrecognized DVD drive: sometimes, it happens that Windows operating system is unable to recognize a DVD drive even if this latter is fully functional. DVD Drive Repair is able to restore it easily without reinstalling Windows or performing a system restore. Backup system: in order to avoid all potential problems when performing the DVD drive repair, it suggests creating a restore point. By this way, if a problem occurs during the process, the user can always restore his system and recover his data. 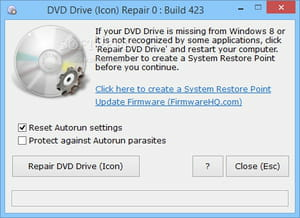 Autorun settings: apart from the features mentioned above, DVD Drive Repair is also able to restore the autorun settings to default if needed. Moreover, it can also disable some features for removable drives so as to protect the system from autorun virus. DVD Drive Repair is an open source and is downloadable for free. It is able to block application that start automatically. Latest update on December 2, 2016 at 04:34 AM.